Unfinished Bauhaus typography sketches finally get completed. The legendary Bauhaus school of design only operated for 14 years before being closed due to pressure from the Nazi regime. Yet the Bauhaus aesthetic had a profound influence on modern graphic design. Now designers can use previously lost Bauhaus type sets specially recreated by Adobe and Erik Spiekermann in partnership with the Bauhaus Dessau Foundation. 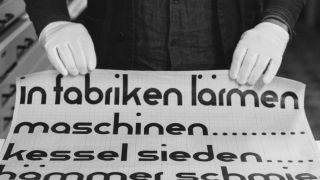 Created as part of Adobe's Hidden Treasures of Creativity series, The Lost Alphabets of Bauhaus Dessau sees five unfinished fonts made by five legendary design masters finally get completed. Using century old, unfinished typography sketches and letter fragments as their basis, the sets will be made available exclusively for Creative Cloud members. World-renowned typeface designer, Erik Spikermann, headed the process of completing and digitising the original Bauhaus typography sketches and turning them into Typekit font sets. Working with international typography professionals and design students, Spiekermann and his team were able to calculate how the Masters originally planned to finish their work. The first two fonts in this set, modelled on the work of Joost Schmidt and Xanti Schawinsky, are available to download for use in Typekit from today. The remaining three fonts are due to launch over the coming months. "The Hidden Treasures Bauhaus Dessau is an ongoing project that is committed to revitalising lost creative history and using it to inspire new generations," says Adobe's Senior Director of Campaign Marketing, Simon Morris. Following on from the success of last year's Hidden Treasures project, which saw the paintbrushes of Edvard Munch become Photoshop tools, Adobe hopes to spark interest in another important period of art history. "This year, Adobe is celebrating the power of the written word, the creative impact font designs have in how we communicate and the role they play in arts and culture. We hope that, once again, by bringing these forgotten treasures into the modern day, we can energise a new era of creativity."